This free app — Versu — is very different from The Dreamhold, the interactive fiction app I reviewed yesterday. In the stories in Versu (there are a few free ones and then you can purchase others in a library), the reader makes choices about the dialogue and actions of a character in the story, and those choices shift the narrative. 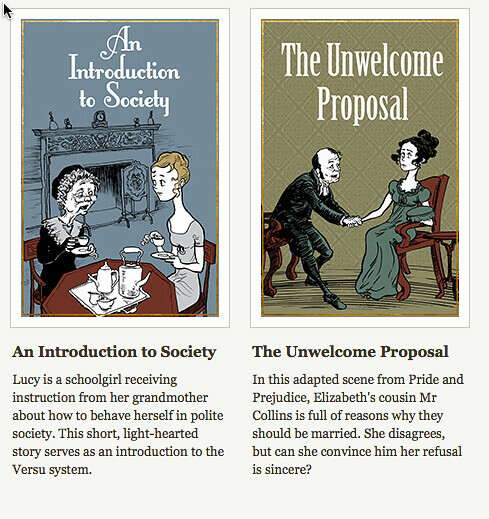 The first story — An Introduction to Society — has a main character, Lucy, interacting with her grandmother as she prepares to meet other members of high society. It’s like an English novel of manners, with choices for behavior and actions. And at some points, the grandmother breaks out of her role in the story to become a narrator to how to play the game (which, to be frank, is slightly odd when it first happens because you think you are still reading the story and you realize the grandmother is talking to you.) While I did find the interface interesting, this is clearly a story that might interest an adult more than a student (and no doubt, it was not designed for teaching interactive fiction). However, it could work with high school students who are studying English literature. Oddly enough, I felt less agency as a reader/player with the Versu story than I did with The Dreamhold (which I reviewed yesterday). It was more like a neat diversion piece of reading than a full immersive experience. Maybe this is because you have to choose from a menu of choices provided by the story. But the Versu app is worth checking out, particularly for the way that writers Emily Short and Richard Evans uses character motivations and thoughts as well as dialogue to pace the story forward. The emotional wrinkle to interactive fiction is pretty interesting, and something I have not yet come across in my adventures exploring this kind of story/game. And I am intrigued by the mentions of players writing their own stories, although I don’t quite see that option yet. (Versu is pretty new, so maybe that kind of writing component will fold out later). PSS — here is a link to all the posts I have been sharing out around interactive fiction. The Dreamhold is an interactive fiction story that is designed to introduce readers to the concept of exploring story via text only (No graphics. No animation. Only words and imagination). A free app from iTunes, The Dreamhold puts the reader/player into exploration mode, as you wander around a castle of some sort, and you slowly realize that it might be a place of magic. There are a lot of things to like about The Dreamhold. It’s free for both iPad and iPod/iPhone, it has a helpful system of “hints” built into the interface, and it simplifies the experience just enough to allow even the most novice of interactive fiction readers (like me) to have fun and understand the concept. See you in the castle! As I explore Interactive Fiction and Choose Your Adventure genres, I realized that I have an app that is all that on my Ipad. 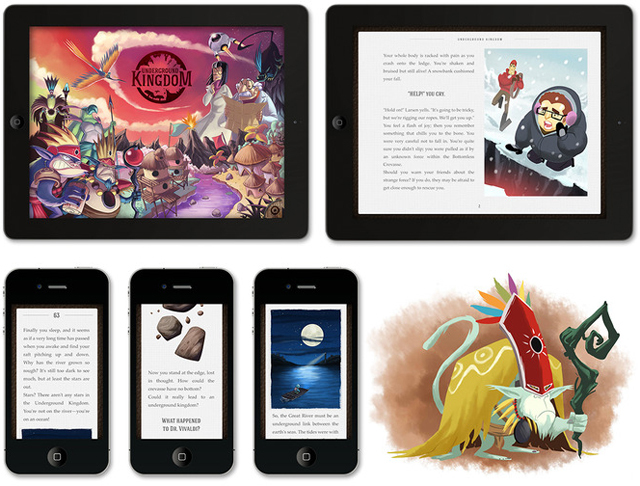 I had forgotten about Underground Kingdom, for some reason, and yesterday, I returned to the interactive ebook to see how it might help me think about my students reading and writing interactive stories. Underground Kingdom does a nice job of adapting the old Choose Your Adventure story concept (there are 23 possible endings and you can access a map that shows your path and your dead ends, so you can always jump back into the story at different points). I had fun reading/playing this story, although I wasn’t all that overwhelmed by the graphics and the story is still pretty text-heavy. Still, the plot moved at a rapid pace, and the use of second person narrative making choices was effective. I liked that when I hit a dead end, I could venture back to the story map and keep going in another direction. In fact, after 25 minutes of reading/playing, I still seemed to have a long way to go with the story. It makes me wonder if there are other Choose Your Adventure stories out there in ebook/interactive format. Do you know of any others? CommonSense Media just put out an interesting guide to Apps called PowerUp that might help students with special needs and learning disabilities. I think one of the possibilities of touchscreen and multimedia devices is that it can make a wider array of content more available to a wider range of students. But, let’s face it, there is a lot of junk apps out there, too. CommonSense Media does a nice job of annotating the apps in this free list (which is also downloadable as a PDF) and putting them into various categories, and then sorted by difficulty/age levels, that can be helpful for teachers and parents to consider. Not all of the apps are free, however. But they do seem like an interesting collection worth a gander. For less than five bucks, the Garageband App on the iPad is an amazing steal. I hadn’t quite realized it until I sat down yesterday morning to work on a new song that my guitarist/friend John had started writing as a sort of theme song for our band, Duke Rushmore. The idea is to have a short, jumpy song to get us into the night. He asked me to write some lyrics, and I decided to use GarageBand on the iPad to replicate his riff and add some drums. I am still waiting for an adaptor that will allow me to connect my Snowball Microphone directly into the iPad, so I had to bounce down tracks and email the master file to my laptop, where I worked on adding the vocals. But the music was all done directly on the iPad. I really love the drum feature, which is built as an intuitive touchscreen creator. You move elements of the drums around a cartesian coordinate system (loud/soft, simple/complex) and the beat changes. For the bass and keyboards, I turned off the automatic chords (which are fun to play with) and plucked strings/hit chords and notes on the keyboard to create the music, and while it is not perfect, it worked for a demo. I also handed the app to my 8 year old son and my 12 year old son, and within minutes, they were creating songs, and having a blast. It’s that simple to use. And I like the feature that allows you to email the file or set up an account on Soundcloud to instantly share the music that way, too. There’s a lot to like, and for $4.99 — it’s got to be on the best deals out there. Here is the song that I ended up with: Dancing with the Duke. Remember, it’s only a demo. We’re going to funk it up a whole lot more than this. PS — this is a great tutorial site for the app. I ‘m a news junkie. I admit it. It comes from spending a decade as a newspaper reporter. So I have been pleasantly surprised by an app I found called — wait for it — Newspapers, and what it does is synchronize and provide access to hundreds of newspapers around the world. It’s free, too, and pretty easy to use. You just use the globe to find countries (or the search engine), and then choose the newspapers you want to read (some are in English and some are in native languages. Both experiences are pretty neat.) You can favorite newspapers, too, to make it easy to return to their sites. For example, I just went from looking through some Russian newspapers to learn about local reaction to the meteorite event that happened last night, and then bounced over to a New Zealand newspaper to read about developments in the Pistorius case, and then ended up closer to home with my local newspaper — all off the same app. One thing that this kind of news traveling does is remind you of the lens in which countries and publishers see and report the news of the world. Biases can be uncovered, and even political filtering noticed. It would be an interesting to use this app to do an analysis of a single news event across various newspapers. It’s no secret that I love stopmotion animation (See my website resource for teachers: Making Stopmotion Movies). I love watching it as magic on the screen and I enjoy trying to make my own, too. I’ve always often brought stopmotion animation into the classroom. So I was intrigued by this app called Animation Desk, which is available for the iPod and iPad. I have it on the iPad, where the canvas is larger and easier to use. Essentially, it is a fairly intuitive program to use that allows you to draw, frame by frame, and then create a simple movie that can be exported to YouTube and other sites. I liked the relative simplicity of the design of the App, and while I am still trying out some of the bells and whistles, I had made a short video (Bouncy) in minutes and when my son joied me, we worked together on another one (Dognose). It was a lot of fun. There is a free version of the app but I shelled out the $4.99 because I wanted all of the features. I think the free version is a good place to start, though. Of course, now I realize that I had better do some app updating on my stopmotion website resource. I don’t even have an App area there. My son and I tried out the free, limited version of Marble Math Multiplication on the iPad. Here is one example of an app that functions better on the smaller screen, in my opinion. Given that the math skills game works mostly via the twisting of the device to move the marble to the right answer in a maze, the larger iPad seemed to be more of a pain in the neck than an optimized playing experience. We’d twist the iPad to put the marble in play, and then lose sight of the play. (You may feel different, and there is an option to use your finger to “guide” the marble instead of tilting the device, but really … what kid will choose that?) An earlier version of Marble Math on our iPod Touch was easier to play, since the Touch is there in the palm of your hand at all times. The free iPad app is a taste of the larger Marble Math app (two versions — one for younger kids and one for older kids). The larger app has more options for creating avatars and choosing the math operations that will be featured, which is handy. While the concept of the app is clever enough — you have to solve a math problem and then move the marble through a maze to the right answer, avoiding various obstacles along the way — the arcade-style app loses its flavor after a while. In this situation, the app really is more of a skill re-enforcer than a game that keeps kids coming back for more and more. The developer certainly tried to bring in elements to make it more engaging — the ability to redo a level that you do wrong, a scoreboard, levels of increasing difficulty, etc. What I did notice with my 8 year old son, however, is that he gave up on solving the math problems and instead, began moving the marble randomly around the screen, hoping to bump into the right answer and purposely hitting the obstacles. When he failed at that a few times, he quit the app altogether. In the classroom, you’d be wise to set up some system for kids making progress, I suppose. In the end, Marble Math is one of a growing stream of skill-related apps that are a notch above worksheets, but will not likely keep all kids busy for long stretches of time. For parents, it is a game that can help reinforce some basic math concepts. I am on the hunt for interactive books on the iPad that really use the technology of the device to create a different kind of reading experience. Perhaps I err in having The Fantastic Flying Books of Morris Lessmore as the ebook/Holy Grail that I compare others to, but I figure: isn’t it about time that companies push the development of interactive books in new and interesting directions? (or am I being unrealistic?). Just adding some sound to a book doesn’t make it much of an interactive experience. That said, Bartleby’s Book of Buttons (today, I review the first volume, The Far Away Island, and another day, I will review the second volume in the series) does a pretty decent job of pulling the reader into the experience of the story. Simply put, Bartleby is on an adventure to collect more “buttons” for his book of buttons, and that leads him to Mystery Island where danger rears its head. (When I first heard “buttons,” I thought of shirt buttons, and wondered why anyone would collect those. I soon realized that “buttons” are literally buttons that you can press and make things happen. Perfect for a game, right?). The narrator’s Australian (I think) accent gives the story a different kind of “feel” to it, at least for my son and I.
I suppose the challenge for developers is how to match the possibilities of the technology with the development of a good story for a wide age group audience. One of the major shifts in the Common Core is the move towards reading informational texts. This includes charts, graphs, maps and more. So when I noticed this free app — HistoryMaps — I was curious. Maps can tell amazing stories, but students of course needs strategies for learning how to “read” a visual display of information. This particular app can be helpful, although you should know that its name tells you exactly what it is: a collection of historical maps (and very Europe-focused). There’s almost no text, and very little historical reference to the maps (other than some time periods). But that lack of information is what makes this app so fascinating. What can we infer from the map of Omaha Beach from the WW II section? Where do troops land and what was the landscape like? How about Waterloo in 1815? Or the layout of the city of Paris during the French Revolution? And what did the European continent look like in 814 after the death of Charles the Great? Pull up the map and see. One of the more fascinating maps is the Map of Discovery, which shows the paths of explorers from 1340-1600. PS — it’s free but you have to put up with some banner ads at the bottom of the page. Just thought you should know that.